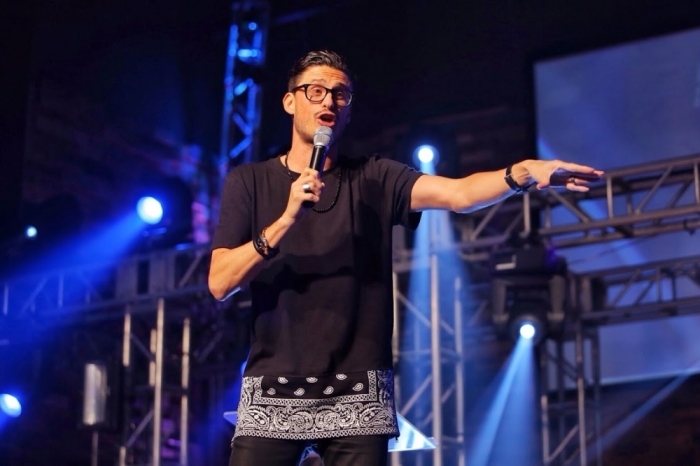 NEW YORK — Chad Veach, formerly on staff at Judah Smith's The City Church in Seattle, Washington, has a suggestion or two for ministry leaders who might be more committed to their methods than they are to exploring new ways of sharing the Gospel's relevancy with today's youth. Veach, who announced earlier this month that he and wife Julia would be moving back to Los Angeles to plant ZOE (pronounced zo-aye) Church, has a heart for youth ministry and has even been called an "expert" in that particular area of outreach due to a vibrant youth and young adult ministry he oversaw at a previous church. Veach is also a regular speaker at churches and conferences across the nation, which positions him as particularly knowledgeable about how Christians do church in various contexts. When asked in a recent "CP Newsroom" discussion on what trends he has noticed in Christianity during his travels in the U.S. that he finds encouraging, Veach celebrated how "church has gotten better" and how God seems to be at work everywhere. "I think the good trend we're seeing is, everywhere we go, God is doing something special," he said. "So it could be in the South, it could be in the Northeast, it could be in the Midwest, wherever. God is obsessed with His people and He'll do anything to reach them. And it doesn't matter the methodology or the philosophy. It doesn't even matter the denomination or theological background. God's reaching His people." However, Veach noted that one disheartening trend involves "people that are wanting to fall in love with their method and not willing to change." "What got us here, is not gonna get us there," said the 30-something pastor often seem among other Millennial-aged ministers like Rich Wilkerson, Jr., Carl Lentz, and Robert Madu. "I think the only thing that will be troublesome is if there would be any churches or leaders that aren't trying to lean into the next generation of leadership of saying 'how do we reach young people? how do we reach young adults? what are the new methods…?' Again, the Gospel is not tired, but people are tired of tired presentations of the Gospel," added Veach. "I think the Church is only as strong as the next generation so if we have a gap of that, we're gonna miss out on that window." Before the cameras started rolling, CP asked veach a few warm-up questions, one of which was if there were any particular subjects he just won't address from the pulpit. In response, Veach pointed to John 3:16, highlighting "the problem that the light of the world has come into the world but people choose darkness." "I think when we shine a light, we don't have to tell darkness how dark it is, so I don't have to address all these peripheral issues when the Gospel is the main issue," said Veach. "For example, Rich (Wilkerson, Jr.) and I and a lot of our friends, we try to shine bright in dark spaces, and we don't have to go around telling them how dark they are or address these issues. We're just trying to shine bright, and God'll do the rest." "I think some people get themselves in a lot of trouble by trying to make statements about subjects that I don't think are gonna heal anybody. I don't think they're gonna bring that much health to people's souls. So I think as long as we keep pointing people to Jesus, he's gonna deal with the heart issues, he's gonna deal with lifestyle stuff," he added. Veach went on to explain the work of the Holy Spirit, whom he called the "greatest pastor in the world." "So when we lift up Jesus, all people drawn to his side, the Holy Spirit begins to minister, convict, comfort, remind people of what God says," explained Veach. "We let God do the work. I don't even think it's our job to go off on tangents and get ourselves in trouble over what could be trivial things." His job, as far as the married father of two is concerned, is to preach the Gospel, and in ways that people can connect with it. "The Gospel is the Good News that Jesus has come to save us," said Veach. "He's not trying to make bad people good. He's trying to take us from death to life. And that's the beautiful exchange, that Jesus offers up everything that he had and takes away everything that we have, all of our sin, all of our shame, all of our guilt. He is the only way to heaven, he is the way. I think people need today a presentation of Jesus with pure passion, pure conviction. … That was Paul (the apostle), right? So persuasive."